Launch into the Heart of Battle! Command the battlefield from afar with Ranged Tactics Toolbox! 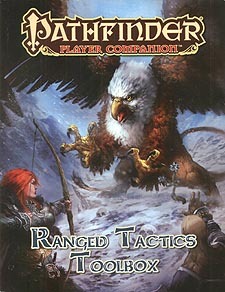 The fresh new tips, tricks, and tactics in this volume enable your Pathfinder RPG character to perform a huge variety of daring deeds from a distance—whether you're launching fearsome warning shots at distant foes, hurling axes that swirl with cyclonic energy, or shooting your bow while clinging to a rope with your legs.